The Philadelphia police are seeking a man who allegedly fired shots into the glass doors of a women's shelter in Logan. 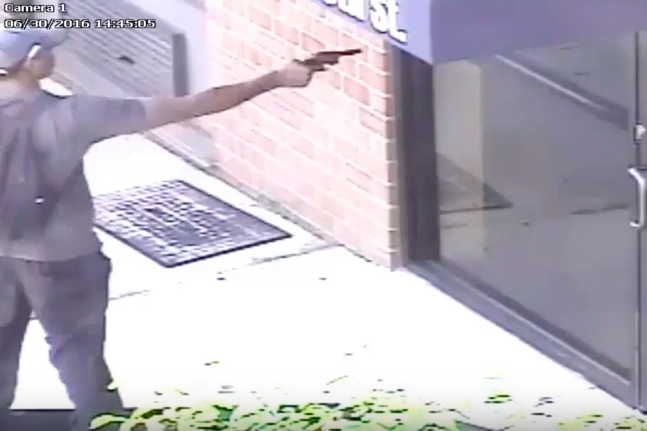 An armed man fired shots into a Philadelphia women's shelter Thursday afternoon, police said, after a women he had followed from a nearby store had entered the building. The Philadelphia police are seeking the public's help identifying the man, who is seen on surveillance video drawing a handgun and firing three bullets into the glass doors of the Safe Haven Women's Center nearby in Philadelphia's Logan neighborhood. When woman told the suspect that she wasn't interested, police said, the man followed her around the store as she shopped. He then followed the victim out of the store when she left. Police said the male sought is between 5-foot-9 and 6-feet tall and weighs about 200 pounds. He has a medium brown complexion, is clean shaven and was wearing a black Nike baseball cap, gray Nike t-shirt, dark-colored basketball pants and a dark colored backpack. Police said that the suspect fled on foot and was last seen headed east on Fisher Avenue toward 13th Street. According to police, no one was injured in this shooting.